This week I finished a paper cut which I can’t share with you, just in case the new owner sees it before they are given it. I’ve also started a portrait which I can’t show for the same reason, so I haven’t got a lot to fill today’s blog! I can share this little project though. It’s for BBC One’s ‘Little Painting Challenge‘ for which artists submit postcard sized pieces of art to be in with a chance of winning £500 of art supplies. 1,000 of the best entries will be exhibited in the Whitworth Gallery in Manchester (a little far for me to visit, but it would be cool nonetheless!). As I’m enjoying drawing these miniature portraits at the moment, I’ve decided to incorporate them into my entry. 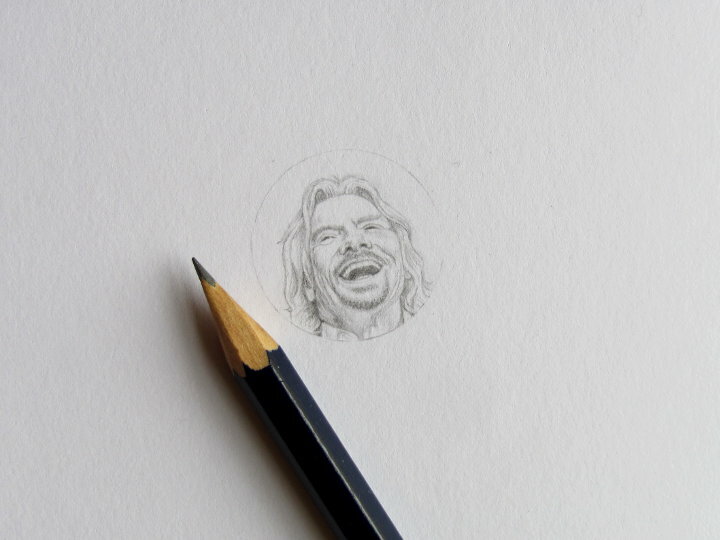 I’m not entirely sure how it’ll look in the end, but I’m envisaging five portraits, of which Richard Branson is the first. He’s not finished yet, but nearly there. 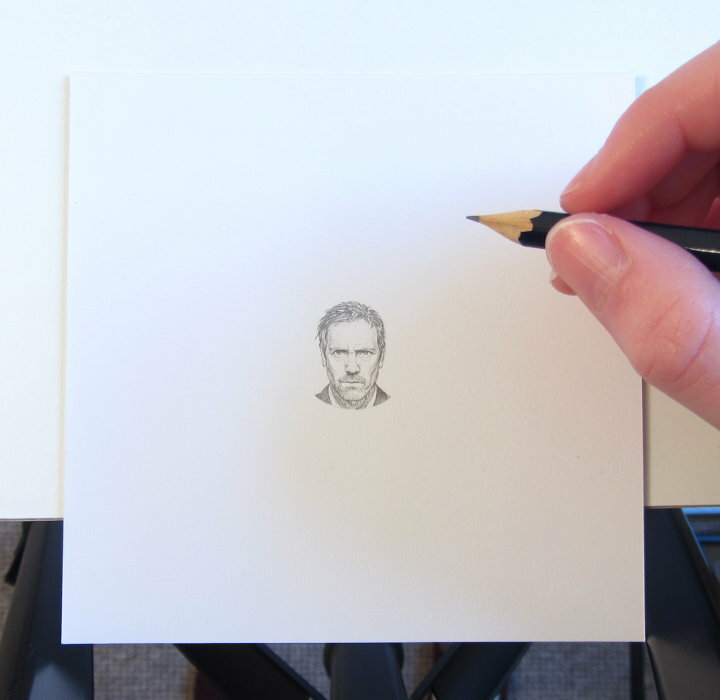 The subject for this week’s miniature portrait for my 52 faces challenge is Hugh Laurie (thank you Alexandra from Blue Chair Diary Illustrations for the suggestion). I’ve now got a little list of people to draw thanks to suggestions on my Facebook page, which is good as I was running out of inspiration! I’m a little short of female subjects though (due to lots of hunky actors being suggested! ), so if anyone has any ideas for ladies to draw, they would be most welcome! That’s it peeps, have a great week! PS. I have just discovered an AMAZING artist, Nicolas V. Sanchez who uses ballpoint pen to create incredible portraits. I recommend taking a look at his work! I’ve linked to the ‘ink’ page of his website here, but take a look around as he’s also a great painter. I’m sharing this post on the following blogs: The Queen of Creativity, Handmade Harbour and Blue Chair Diary Illustrations! miniature to pick her back up after her fall. Have a wonderful week. Aww, thank you Ali! I have to admit, I started a mini Madonna this week but really wasn’t feeling it! I might give her another go though! Wow, your pieces are so gorgeous! I love them. The postcard project sounds interesting. Has anyone suggested Paloma Faith. I have a bit of a thing about her, not really because of her singing but the way she dresses. Ooh that’s a good idea! Thanks Ginny! Good luck with the postcard project. Mini Hugh Laurie is fab! Thanks for all the suggestions Julie! They’re all really good ideas…I’ve got enough to keep me going for at least 3 weeks here! I am always amazed at the wonderful detail you get on such a small piece of art. Just wonderful. Thanks for linking. Thank you! I much prefer drawing people who aren’t just smiling directly at the camera! Without doubt, You ARE the “MISTRESS”-of-the-POINTY-PENCILS!! And GOOD LUCKwith that BBC thing! BTW, I would love to see you do – [“some” day..?] – a montage of the GAME of THRONES Cast… They all have such great texture to their faces! Hehe! You’ve got that right! I’m sharpening my pencils every five minutes when I’m drawing one of these! Good suggestion on the Game of Thrones cast – I do like the idea of a mini montage! Such exquisite detail in your portraits! Lovely. 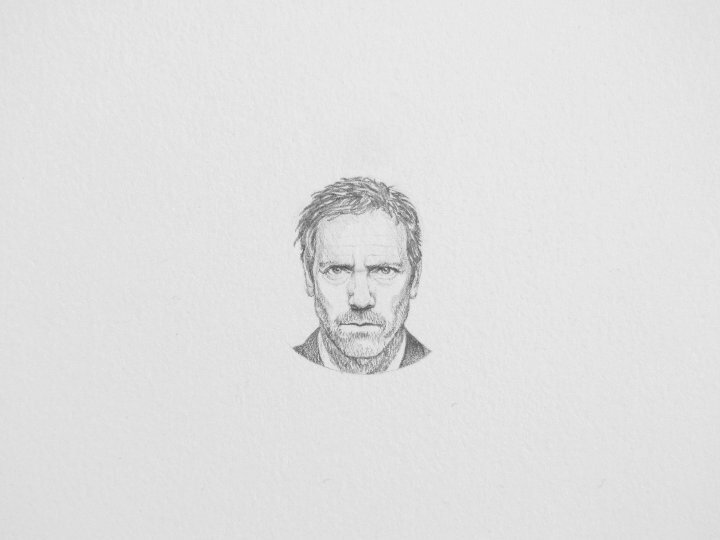 Your drawings are always so beautiful, I love the Hugh Laurie portrait. Your portraits are fantastic! I love them! you are very good, I recognize these people immediately! you are so good at these portraits! Wow! fantastic portrait work and in miniature not less! Beautiful!